In an industry that changes by the hour, how will the shift to mobile healthcare affect you? It seems that patients don’t remember much of their verbal communication with healthcare workers, in fact in one study, recall after consultations was only 14%. Using an iPad, clinicians can show rather than tell, using professionally produced images and video to communicate medical information more effectively and memorably—that 14% recall rose to 85% when visual aids were used. The relatively recent jump in processing power that came with the iPad Pro is being thoroughly exploited by interactive anatomy apps like those by 3DMedical. Amazingly detailed 3D representations of the whole body can be displayed and manipulated, and using the Apple Pencil, the clinician can precisely cut away tissue to demonstrate an injury or surgical procedure—they can even add lumps and bumps to simulate various pathologies. All of this, along with annotations and a voice recording of the consultation, can be stored and then shared with the patient in their copy of the app or integrated into their electronic records. The way healthcare workers make decisions is changing and that is likely to continue thanks to the multitude of iPad apps designed to make their decisions more informed, accurate and reliable. One of the most popular of these clinical decision-support apps, UpToDate, was found by Harvard researchers to reduce hospital stays and mortality by small (−2% and up to -0.6%, respectively) but significant amounts (372,500 days/year and 3833 lives/year). Other apps are created to help doctors with specific issues as they emerge. For example, in response to recent controversy over statin intolerance and side-effects, the American College of Cardiology produced an app to help doctors make systematic, evidence-based decisions when faced with patient concerns over these issues. In an increasingly complex and systematized future, such support apps, whether general or specialized, will become increasingly effective and increasingly essential for healthcare workers. Despite their benefits, iPads and other mobile devices represent a challenge for the control of healthcare-associated infection—a huge problem affecting around 1 in 20 patients. For example, a recent US study across two hospitals found that around 25% of the tested ‘portable electronic devices’ (mainly tablets) were contaminated with pathogens, and a smaller US hospital study from 2013 found that 3 out of the 20 iPads (15%) they tested were contaminated with MRSA. 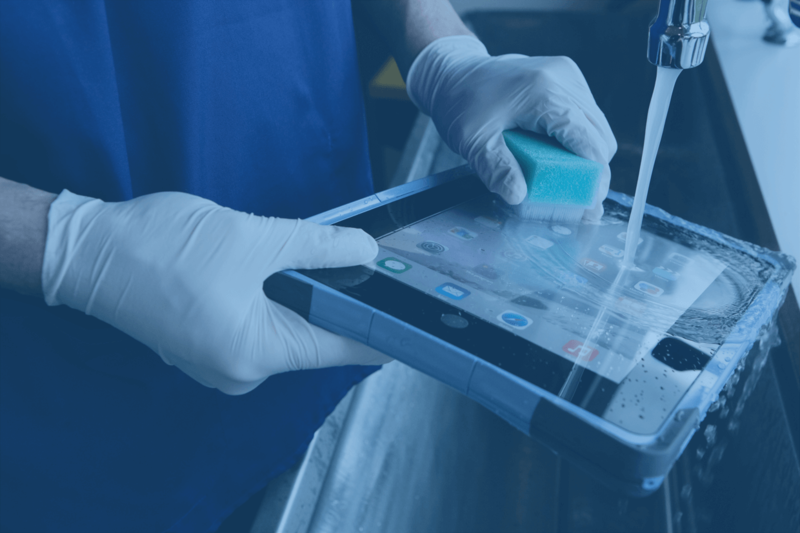 Luckily, such pathogens can be removed by wiping the device with bleach; however, it appears that very few healthcare workers clean their mobile devices regularly. This will need to change, and with the arrival of iPad covers specially designed for clinical use, there are no more excuses. The FlipPad protective case, for example, is waterproof, resistant to chemicals like bleach, and incorporates an antimicrobial coating into the screen protector. Cultural, procedural and technological shifts will all be important in ensuring that progress toward a paperless, device-enhanced future can continue in parallel with progress in infection control. Less miscommunication, less paperwork and less time acquiring and entering information should mean serious time savings for healthcare workers, and a 2012 JAMA study agrees. It found that 78% of resident physicians reported increased efficiency after receiving an iPad, saving about an hour a day, and 68% of house staff noted that delays in patient care were avoided thanks to the iPad. Time being money and all that, financial savings should follow for healthcare providers—or at least better value for their money. Other savings can come from switching to electronic textbooks and training materials and replacing dedicated medical-image viewers with much cheaper iPads (where possible). Furthermore, in the US, providers now face financial penalties for not making the transition to fully electronic health records, which will likely drive a corresponding transition towards iPads and their like. Major healthcare providers throughout the world are pushing a transition to paperless record systems, and iPads are facilitating this huge change. After all, they are the obvious replacement for the countless charts, files and forms flying about every hospital and clinic—many of which have to be later transcribed into a computer anyway. Some might think that signing documents would be present a problem here, but electronic signatures have been legally binding for over a decade in most countries. On the other hand, patient information is highly sensitive and protected by law, so mobile devices and their clinical users will need to adapt to constraints and concerns relating to privacy and cyber security. This post is sponsored by the FlipPad – The antimicrobial iPad case for the Apple iPad Air 2 and 9.7inch Pro.